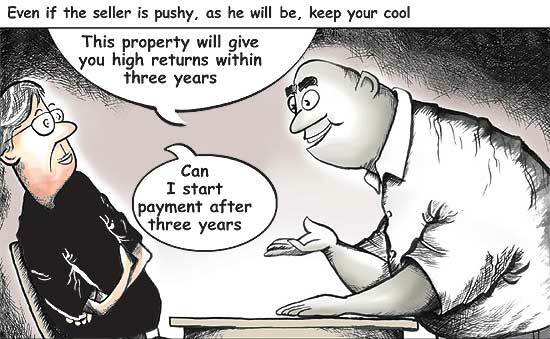 If you don't bargain, you may end up paying the property seller a much higher price than you should. Some tips from Ashwini @OutlookIndia. You do bargain for the price when you shop for vegetables, don’t you? In fact, it’s one of the most common things in any monetary transaction you conduct. So, if you plan to buy a house in the near future, will negotiations be a part of the process? During the property boom, especially between 2004 and 2007, negotiations were a rarity. It was a seller’s market and homebuyers had no option but to accept the price asked for and the terms and conditions laid down by the developer. However, things are changing now. The lull in the property market since 2008 is almost over and there has been a revival in sales, especially in the last six months. Developers and sellers, too, have started to realize that negotiation is an integral part of the process. More importantly, if you have a good credit profile, you can also negotiate a better deal with the institution you are planning to take a loan from. We list a few things that you need to keep in mind on the negotiation table. Why negotiate? The house you buy is arguably your biggest investment. It’s a very high-value transaction and, in most cases, the home buying process itself is so tedious that you may not like to make that extra effort. This desperation to close the deal at the earliest is one of the reasons why you don’t even want to walk the path of negotiation. More often than not, homebuyers are bogged down by the might of the developer. After all, even today, agreements that you enter with a developer or a housing finance company are heavily loaded against you, leaving little room for negotiation. There is, however, a very strong case for you to negotiate before you close the deal. Let’s take an example. If the quoted price of a house is Rs 40 lakh and you do not negotiate, you will need to arrange for Rs 6 lakh from your resources (assuming that you are required pay 15 per cent of the cost of the house as downpayment.) You will need to get the balance amount—Rs 34 lakh—funded through a home loan. The EMI on the same for 20 years at 9 per cent would be Rs 30,591. Supposing you are able to bring down the price by Rs 1.50 lakh, you will have to pay Rs 38.50 lakh and the downpayment would be Rs 5.77 lakh and the loan requirement, Rs 32.72 lakh. The EMI on this amount at 9 per cent for 20 years would be Rs 29,444. This means you pay Rs 1,147 less per month. Any saving during the homebuying process is a boon, considering the fact that, typically, homebuyers are down to counting pennies during that period. Negotiate with whom? If you are planning to buy a house from the primary market, you will negotiate either with the developer or with the real estate agent appointed by the developer. Earlier, there was not much room for negotiations in the primary market. However, the changing fortunes of the residential property market have worked in the homebuyers’ favour. So, now you can ideally negotiate on things such as the basic sale price, preferential location charges if applicable, parking charges and so on. If you are planning to buy a house from the secondary market, you will either have to negotiate with the direct seller of the property or the real estate agent appointed by him. Here, you can negotiate on things such as the quoted price of the seller, the schedule of payments that you have to make to him, the time by when you can start the process of getting the property registered in your name, and so on. Also, if you are able to bring down the price of the property, the brokerage fee will also be less, as it is typically 1 per cent of the agreed sale price. In case of a home loan, if you have had an earlier association with the lending institution, such as a car loan or a personal loan that you had serviced regularly, you can quote those loan accounts to show your good repayment track record. Step forward. Before you sit down for negotiations, make a list of items that you want to discuss. Also, have a fair idea of the maximum price that you can and wish to pay for the property. “It would be of help if you involve an intermediary at the negotiations,” says Aditya Verma, business head and vice-president, makaan.com. This intermediary could be anyone who you trust and possesses the necessary negotiation skills, along with some knowledge of carrying out a property transaction. He could be your real estate agent, lawyer, chartered accountant or even a family member, friend or colleague. 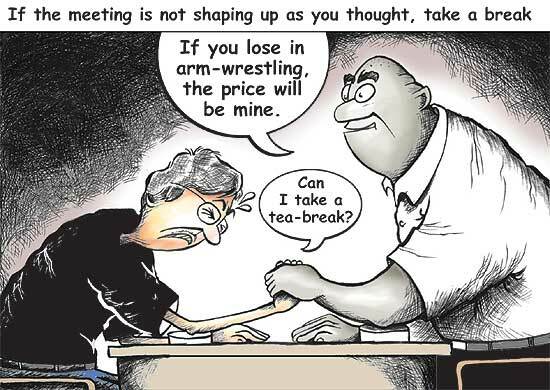 At the negotiation table. While selecting the property of your choice, always keep 2-3 options open. This way, if the deal does not get through, you do not have to reinvent the wheel all over again. Also, if you have options, you will not be desperate to close the deal even when it’s not on your terms. It also makes sense for you to let the seller know that you have options. Remember that there is a reason for the person to pull out of his investment, especially in case of resale properties. So, maintain your composure and stick to the plan. Make sure only one person speaks from your side. If there are too many voices, the seller will get the hint that you are not well-prepared for the meeting and he may jack up the price further. Even if the seller is pushy, keep your cool. Try not to disclose your exact budget for the house. 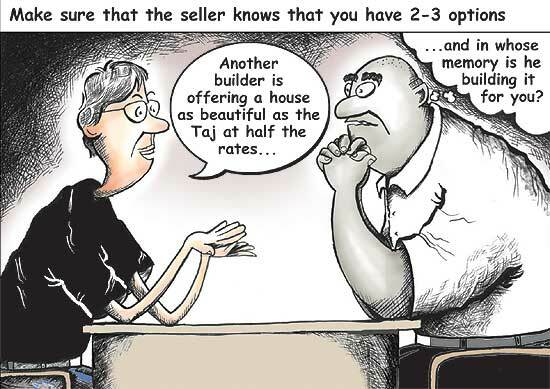 If the seller asks for your price expectation, quote a figure which is lower than your exact budget. “Do not boast about your budget,” says Verma. Try not to show your desperation to seal the deal. If you think that the meeting is not going in the direction you expected it to, take a break. This will break the monotony, especially if the seller is very pushy. If you think the seller is being over-demanding, don’t hesitate to say ‘No’. If the seller, too, is desperate to strike a deal and had been shooting in a dark to get a better price, he might mellow down. paid, the schedule of balance payments towards downpayment and, most importantly, the date when the formal agreement will be made. It may seem like a lot of effort, but a little bit of awareness could help you get a much better deal. So, stay focussed and don't give into pressure.